Villa UJV 233, also known as Palm Springs, has four bedrooms, four bathrooms, a pool and a fitness room and sits on the renowned Gouverneur hillside, offering outstanding sunset views. The villa is a masterpiece of modern architecture and design, cleverly mixing the latest technology with a relaxed environment. The overall ambience is one of pure Caribbean calm and serenity. Villa UJV 233's stunning features include a heated infinity pool, a beautifully landscaped deck, superbly designed living and dining areas, private spaces for intimate sun bathing, a gym/fitness room and extremely comfortable furnishings. The main house is comprised of a remarkable 600 sq.ft master bedroom with en-suite bathroom, his and hers dressing area, powder room, rain shower and outdoor jacuzzi. A second bedroom, below bedroom #1, has en-suite bathroom and offers sea views. 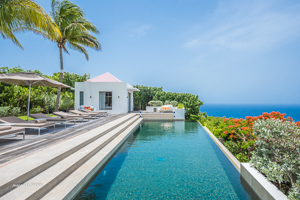 The two other spacious bedrooms, with en-suite bath and sleek design, are located in a separate pavilion beyond the pool - each has its own individual private terrace and offers sensational views overlooking the neighboring islands. Villa UJV 233's integrated floor plan has been masterfully designed to allow for continuous flow and delightful tropical breeze throughout the property. The living areas sink naturally into the breathtaking views and provide ample opportunity for alfresco dining and lounging. Additional features include a gourmet equipped designer kitchen, multiple plasma TVs, surround-sound throughout the property, and covered parking area. The villa is complemented by the finest linen, bathrobes and towels in each bedroom. Continental Breakfast served each morning with every booking from Dec 15 to April 15. Seven night minimum stay applies.